SYS Passive Preamp VOLUME CONTROL AND 2-INPUT SWITCH SYS stands for "switch your, er...schtuff." Sys is a simple, 2-input passive preamp. No electronics. No power. No distortion. Just a 2-way switch and a potentiometer. Huh? Why would you want such a thing? 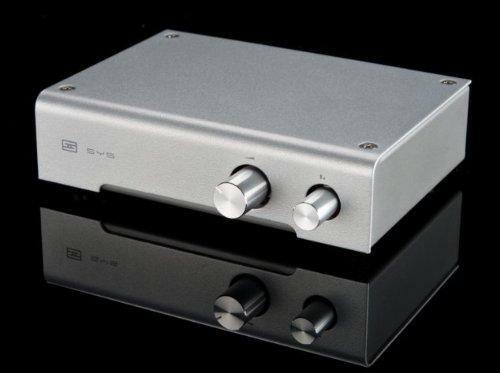 Well, if you've ever wanted to use one of our DACs with powered monitors, Sys puts the volume control right at hand. Same goes for using two sources with one of our headphone amps-use Sys to switch between a DAC and a phono preamp, for example. And, you don't have to use Sys with our gear at all. It's a simple, high-quality, passive preamp that works with pretty much any line-level source.